Indian food is one of those cuisines that most of us just can't cook at home. Few of us can get it right, and the gulf between tandoori or tikka saag cooked right and those dishes cooked from a jar is wide, to say the least. 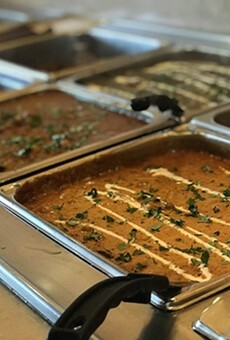 Luckily, Tucsonans who love naan more than tortillas can always head to Gandhi Cuisine of India, the deserved winner of this category every year since 2001. As Weekly readers obviously know, Gandhi's lunch buffet--cheap at $5.95 from 11 a.m. to 3 p.m.--is one of the best, and most delicious, deals in town.